Lightning is a sudden electrostatic discharge that occurs during an electrical storm. This discharge occurs between electrically charged regions of a cloud (called intra-cloud lightning or IC), between that cloud and another cloud (CC lightning), or between a cloud and the ground (CG lightning). The charged regions in the atmosphere temporarily equalize themselves through this discharge referred to as a strike if it hits an object on the ground, and a flash, if it occurs within a cloud. Lightning causes light in the form of plasma, and sound in the form of thunder. Lightning may be seen and not heard when it occurs at a distance too great for the sound to carry as far as the light from the strike or flash. Lightning occurs approximately 40Ð50 times a second worldwide, resulting in nearly 1.4 billion flashes per year. Many factors affect the frequency, distribution, strength and physical properties of a "typical" lightning flash in a particular region of the world. These factors include ground elevation, latitude, prevailing wind currents, relative humidity, proximity to warm and cold bodies of water, etc. To a certain degree, the ratio between IC, CC and CG lightning may also vary by season in middle latitudes. Because human beings are terrestrial and most of their possessions are on the Earth, where lightning can damage or destroy them, CG lightning is the most studied and best understood of the three types, even though IC and CC are more common types of lightning. Lightning's relative unpredictability limits a complete explanation of how or why it occurs, even after hundreds of years of scientific investigation. A typical cloud to ground lightning flash culminates in the formation of an electrically conducting plasma channel through the air in excess of 5 kilometres (3.1 mi) tall, from within the cloud to the ground's surface. The actual discharge is the final stage of a very complex process. A typical thunderstorm has three or more strikes to the Earth per minute at its peak. Lightning primarily occurs when warm air is mixed with colder air masses, resulting in atmospheric disturbances necessary for polarizing the atmosphere. However, it can also occur during dust storms, forest fires, tornadoes, volcanic eruptions, and even in the cold of winter, where the lightning is known as thundersnow. Hurricanes typically generate some lightning, mainly in the rainbands as much as 160 kilometres (99 mi) from the center. The first process in the generation of lightning generation is the separation of positive and negative charges within a cloud. Ice crystals inside cumulonimbus clouds rub against one another due to the strong updrafts in these clouds, thus building up a strong static charge. Positively charged crystals tend to rise to the top causing the cloud top to build up a positive static charge and negatively charged crystals and hailstones drop to the middle and bottom layers of the cloud building up a negative static charge. Cumulonimbus clouds that do not produce enough ice crystals usually fail to produce enough static electricity to cause lightning. Lightning can also occur as a result of volcanic eruptions or violent forest fires which generate sufficient dust to create a static charge. The second process is the build up of positive charges on the ground beneath the clouds. The Earth is normally negatively charged with respect to the atmosphere. But as the thunderstorm passes over the ground, the negative charges at the bottom of the cumulonimbus cloud cause the positive charges on the ground to gather along the surface for several miles around the storm and becomes concentrated in vertical objects including trees and tall buildings. If you feel your hair stand up on end in a lightning storm beware. The negative charges from the cloud are pulling the positive charges inside your body to the top of your head and you could be in danger of being struck. The third process is the generation of the lightning. When sufficient negatives and positives gather in this way, an electrical discharge occurs within the clouds or between the clouds and the ground, producing the bolt. This type of lightning is known as negative lightning due to the discharge of negative charge from the cloud, and accounts for over 95% of all lightning. Some lightning strikes take on particular characteristics, and scientists and the public have given names to these various types of lightning. Heat lightning is nothing more than the faint flashes of lightning on the horizon from distant thunderstorms. Heat lightning was named because it often occurs on hot summer nights. Heat lightning can be an early warning sign that thunderstorms are approaching. In Florida, heat lightning is often seen out over the water at night, the remnants of storms that formed during the day along a sea breeze front coming in from the opposite coast. Thunderstorms are some of the most spectacular events in nature, yet what we can see from the surface of our planet is only the beginning. There are bizarre goings on in Earth's upper atmosphere, and a new mission aims to learn more about them. Launched to the International Space Station on Monday, the Atmosphere-Space Interactions Monitor (ASIM) will observe the strange electrical phenomena that occur above thunderstorms. For years, their existence has been debated - elusive electrical discharges in the upper atmosphere that sport names such as red sprites, blue jets, pixies and elves. But an astronaut has confirmed the displays do exist, capturing stunning footage of them from the International Space Station. New findings have been published which suggest that the electrical discharges may unsettle the chemistry of the stratosphere, with possible implications for the Earth's radiation balance. The photo above was captured from ESO's Paranal Observatory. A few days earlier during the early morning hours of Jan. 20 Petr captured another series of sprites from the La Silla site, generated by a storm over Argentina over 310 miles (500 km) away. 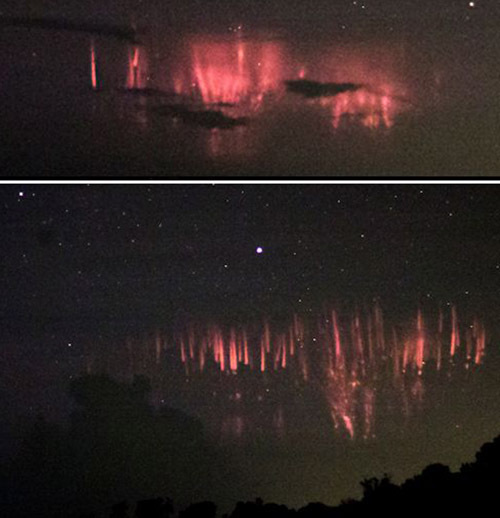 So-named because of their elusive nature, sprites appear as clusters of red tendrils above a lighting flash, often extending as high as 55 miles (90 km) into the atmosphere. The brightest region of a sprite is typically seen at altitudes of over 40-45 miles (65-75 km). 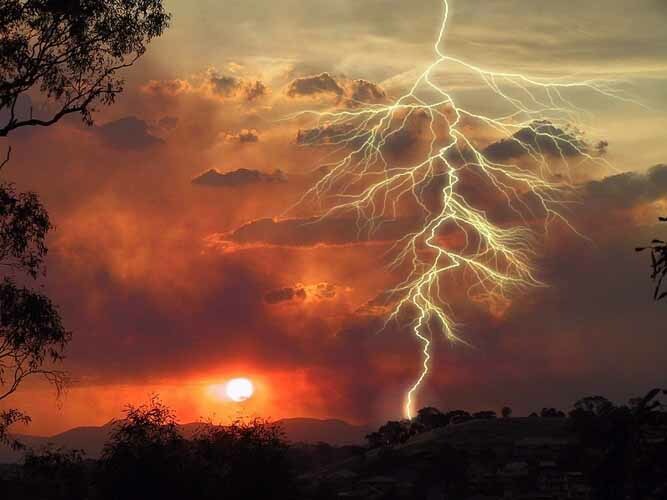 In the blink of an eye, an enormous bright red light flashes above a thundercloud, spreading energetic branches that extend five times taller than Mount Everest and look like jellyfish tendrils and angel's wings. These mysterious phenomena are known as Transient Luminous Events (TLEs), and are usually invisible to the naked eye because they happen on millisecond timescales, too fast to be seen. They occur between 50 to 100 kilometers above the ground, a long-ignored area of the atmosphere that is too high for aircraft but too low for satellites to investigate. There, the thin air interacts with strong electrical fields to ionize molecules and create arcing plasmas. Orbiting above a storm recently, International Space Station astronauts captured a rarely seen type of sky show on camera: a fleeting electrical burst called a red sprite. The red sprite's exceptional size (in a word, giant), plus the resolution and sense of scale in the picture distributed by NASA this week have experts intrigued, despite the fact that red sprites have been seen from space before. Strokes of lightning flashing down towards the ground are a familiar sight during summer thunderstorms, but scientists have capture an image of a rare lightning bolt shooting out upwards from a cloud, almost to the edge of the Earth's atmosphere. These bolts of upwards lightning, one type among a variety of electrical discharges now known to occur above thunderstaorms, are called gigantic jets, and were only first discovered in 2001. Since then, only about 10 gigantic jets have been observed, said Steven Cummer, who was part of the team that photographed this most recent jet. Gigantic jets are essentially the same as cloud-to-ground lightning, only they go the opposite way. Blink during a thunderstorm and you may miss the unusual phenomenon of "sprites" - resplendent bursts of light that, for less than a second, burn brighter than Venus. These brief explosions, which can outshine everything except for the sun and moon, are so fleeting, that scientists still don't know much about how they work. Sprites dance high above thunderstorms, but they're not furtive mythical creatures. They're quick bursts of electricity that have left atmospheric scientists in the dark about their origins. New ultra-high-speed video shows sprites form as fast-paced balls of electricity, not streaks or tendrils as previous footage suggested. The discovery challenges current theories of how mysterious sprites form and could lead to new understanding of atmospheric chemistry. Photos of red sprites, blue jets, elves and sprite halos are now flowing into the University of California, Berkeley's Space Sciences Laboratory from the first satellite instrument devoted to the study of these puzzling high-altitude lightning flashes. Blue jets differ from sprites in that they project from the top of the cumulonimbus above a thunderstorm, typically in a narrow cone, to the lowest levels of the ionosphere 40 to 50 km (25 to 30 miles) above the earth. They are also brighter than sprites and, as implied by their name, are blue in color. They were first recorded on October 21, 1989 on a video taken from the space shuttle as it passed over Australia. Elves were first recorded on another shuttle mission, this time recorded off French Guiana on October 7, 1990. Elves is a frivolous acronym for Emissions of Light and Very Low Frequency Perturbations From Electromagnetic Pulse Sources. This refers to the process by which the light is generated; the excitation of nitrogen molecules due to electron collisions (the electrons having been energized by the electromagnetic pulse caused by a positive lightning bolt. On April 2, 2017, high above a thunderstorm in the Czech republic, an enormous ring of light appeared in the night sky. 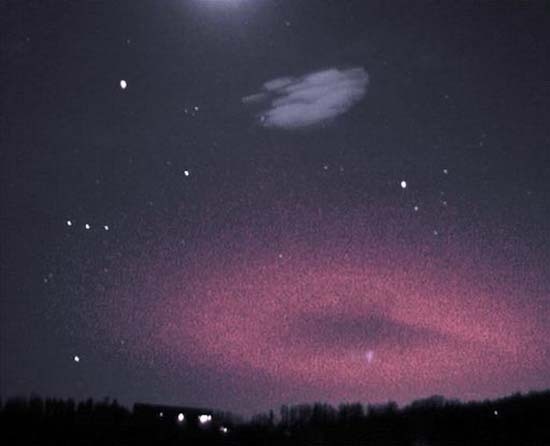 Using a low-light video camera, amateur astronomer Martin Popek of Nydek photographed the 300 km-wide donut hovering near the edge of space. It appeared for just a split second alongside the constellation Orion. This is an example of an ELVE (Emissions of Light and Very Low Frequency Perturbations due to Electromagnetic Pulse Sources). First seen by cameras on the space shuttle in 1990, ELVEs appear when a pulse of electromagnetic radiation from cloud-to-ground lightning propagates up toward space and hits the base of Earth's ionosphere. A faint ring of deep-red light marks the broad 'spot' where the EMP hits. ELVEs often appear alongside red sprites, which are also sparked by strong lightning. ELVEs are elusive - and that's an understatement. Blinking in and out of existence in only 1/1000th of a second, they are completely invisible to the human eye. For comparison, red sprites tend to last for hundredths of a second and regular lightning can scintillate for a second or more. Their brevity explains why ELVEs are a more recent discovery than other lightning-related phenomenon. Lightning has been triggered in several instances. Lightning struck the Apollo 12 soon after takeoff, and has struck soon after thermonuclear explosions. For more information, see triggered lightning. Lightning has been observed on other planets, such as Venus and Jupiter, and electrical discharges between Jupiter and Io often occur. Lightning on Jupiter is estimated to be 100 times as powerful, but fifteen times rarer, than that which occurs on Earth. Lightning on Venus occurs so often that it is speculated that, were colonization to ever occur on Venus, lightning would be a primary power source. A bolt of lightning can reach temperatures approaching 28,000 kelvin (or about 50,000 degrees Fahrenheit) in a split second. This is many times hotter than the surface of the sun. 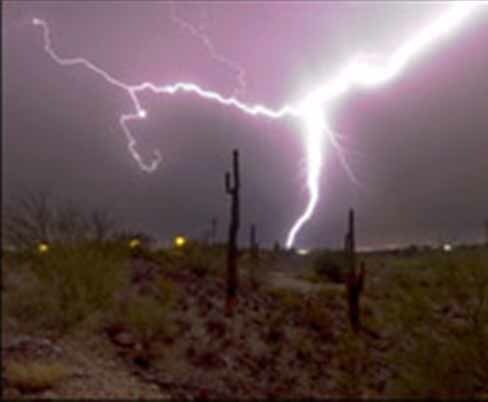 A result of this is that lightning strikes that hit a loose soil or sandy region of the ground may fuse the soil or sand into channels called fulgurites. These fulgurites are sometimes found under the sandy surfaces of beaches and golf courses or in desert regions. It is one evidence that lightning spreads out into branching channels when it strikes the ground. Lightning is responsible for approximately 100 deaths a year in the United States alone. Lightning ranks second only to floods for storm related casualties in the U.S. every year. Many of these deaths could be prevented if basic precautions were taken when thunderstorms are expected in an area. Listening to a radio to keep up to date on storms in the area is the best way to prepare for safety. 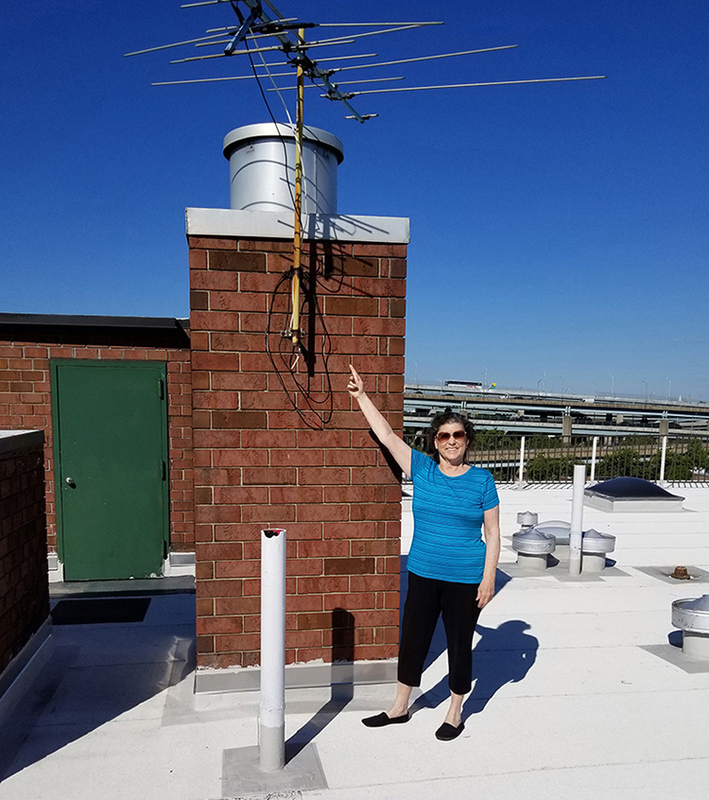 One way to prepare for lightning safety is to install a device known as lightning conductor (commonly known as a lightning rod) for preventing damage by lightning to a building. A lightning conductor is a metal spike that is connected to earth by a low-resistance path. Should lightning strike a building, the current will travel through the conductor rather than through the fabric of the building, causing less damage. Electrical equipment can be protected from lightning by a lightning arrester. This is a device that contains one or more gas-filled spark gaps between the equipment's cables and earth. Should lightning strike one of the cables, the high voltage will cause the gas in the spark gap to break down and become a conductor, providing a path for the lightning to reach the ground without passing through the equipment. water - ocean, lakes, swimming pools, rivers, etc. If you find yourself trapped in an open area during a storm, position yourself close to the ground by squatting with your feet close together and on the balls of your feet. Crouch in a ditch if possible. Avoid proximity to other people (minimum 5 meters or 15 feet). Since lightning spreads when it hits the ground, you want to minimize as much surface area between you and the ground. Remember, humans are good conductors of electricity, lightning tends to strike at the highest thing in an area, because electricity will always take the path of least resistance. avoid contact with conductive surfaces with exposure to the outside such as metal door or window frames, electrical wiring, cable TV wiring, etc. In many cultures, lightning has been viewed as part of a deity or a deity in and of itself. In Greek mythology lightning and thunder are weapons of Zeus, given from Cyclopes. In Mayan mythology Huracan is sometimes represented as three lightning bolts. In the traditional religion of the African Bantu tribes, lightning is a sign of the ire of the gods. Verses in the Jewish religion and in Islam also ascribe supernatural importance to lightning. In Christianity, the Second Coming of Jesus is compared to lightning. The expression "Lightning never strikes twice (in the same place)" is similar to "Opportunity never knocks twice" in the vein of a "once in a lifetime" opportunity, i.e., something that is generally considered improbable. Lightning occurs frequently and more so in specific areas. Since various factors alter the probability of strikes at any given location, repeat lightning strikes have a very low probability (but are not impossible). Similarly, "A bolt from the blue" refers to something totally unexpected. In French and Italian, the expression for "Love at first sight" is coup de foudre and colpo di fulmine, respectively, which literally translated means "lightning strike". Some European languages have a separate word for lightning which strikes the ground (as opposed to lightning in general); often it is a cognate of the English word "rays". The name of New Zealand's most celebrated thoroughbred horse, Phar Lap, derives from the shared Zhuang and Thai word for lightning. In movies and comics of the contemporary U.S. and many other countries, the lightning is often employed as an ominous, dramatic sign. It may herald a waking of a great evil or emergence of a crisis. Various novels and role playing games with fantasy tint involves wizardry of lightning bolt, weapon embodying the power of lightning, etc. The comic book character Billy Batson changed into the superhero Captain Marvel by saying the word, "Shazam!" which called down a bolt of magic lightning to strike to change. The UN World Meteorological Organization on Friday announced that France held the record for longest-lasting lightning bolt, with a flash on August 30, 2012 in the southeast of France lighting up the sky for a full 7.74 seconds. The horizontal bolt travelled 200 kilometres (125 miles). It was a "cloud-to-cloud" discharge. France was bested, however, in the distance stakes by the US. A lightning strike on June 20, 2007 in the state of Oklahoma covered a distance of 321 kilometres, the WMO said. When the world's longest lightning bolt struck over Oklahoma in 2007, it traveled about three-quarters of the length of the state, according to the World Meteorological Organization, which recently announced the electrifying new record. The lightning bolt traveled 199.5 miles (321 kilometers) on June 20, 2007, the World Meteorological Organization (WMO) said. The organization also confirmed the longest duration for a single flash of lightning: 7.74 seconds, for a flash that occurred over Provence-Alpes-Cote d'Azur, France, on Aug. 30, 2012. The two announcements mark the first time that lightning has been included in the official WMO World Weather & Climate Extremes Archive, which documents records for heat, cold, wind speed, rainfall and other climate events. Global warming will significantly increase the frequency of lightning strikes, according to US research. The teams says they have calculated how much each extra degree in temperature will raise the frequency of lightning. For every two lightning strikes in 2000, there will be three lightning strikes in 2100. Some scientists literally spend their time waiting for lightning to strike. Lightning is the second highest cause of annual weather-related deaths in the United States, according to the National Weather Association. It starts fires, causes power outages and wreaks havoc on electronics systems. The science of lightning detection has improved dramatically since Ben Franklin flew his kite in a thunderstorm in 1752. Researchers can now predict conditions that precede a bolt from the blue, and track the location and strength of a strike while it's occurring. There is no more iconic storm image than the brilliant white forks of lightning snaking their way across a menacing sky. But most of it happens too fast for the human eye to glimpse, so researchers use high-speed cameras to spy how the lightning races between sky and Earth. When lightning first develops, it generally sends a bolt called a step leader down toward the ground, branching in seemingly random directions. When the bolt gets close to the ground, it creates an intense electric field, which causes upward streamers that meet it midair. After the streamers attach to the main bolt, the lightning charges down again in a dart leader, which is the bright part observers on the ground actually see. Mysterious and gigantic jets of lightning that shoot up to near the edge of space have now been observed in unprecedented detail, revealing just how much charge they pack and how they form. More than 50 miles (80 kilometers) above Earth's surface, extreme ultraviolet radiation from the sun reacts with air molecules to produce highly charged particles, generating an energetic region known as the ionosphere.In 2001, scientists discovered gigantic jets of lightning arcing up from clouds in the lowest portion of the atmosphere, the troposphere, to the ionosphere. 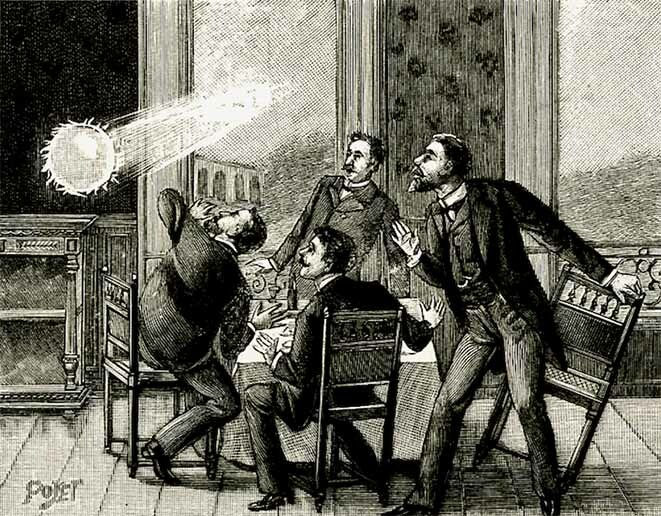 These rarities apparently are caused by the profound difference in electric charge between the ionosphere and the rest of the atmosphere, but much else about them remained unclear. A lightning researcher at the University of Bath has discovered that during thunderstorms, giant natural particle accelerators can form 40 km above the surface of the Earth. Japanese farming folklore has it that lightning makes mushrooms multiply, and new research supports the idea. Mushrooms form a staple part of the diet in Japan, and the fungi are in such high demand that around 50,000 tons are imported annually, so scientists have been experimenting with artificial lightning to see if it could increase the crop. Sandstorms can generate spectacular lightning displays, but how they do so is a mystery. By unlocking the secrets of how sparks come to fly in these storms as researchers are now doing, scientists could help grapple with all kinds of problems, from charged particle clouds that can cause devastating explosions in the food, drug and coal industries to charged dust that could obscure vital solar panels on missions to the moon or Mars. Sand is an insulator, so seeing sandstorms generate lightning would be somewhat like watching electricity emerge from a storm full of rubber balls. It has been an enigma for more than 150 years as to how sand grains can transfer the huge amounts of electrical charge needed for lightning to happen. 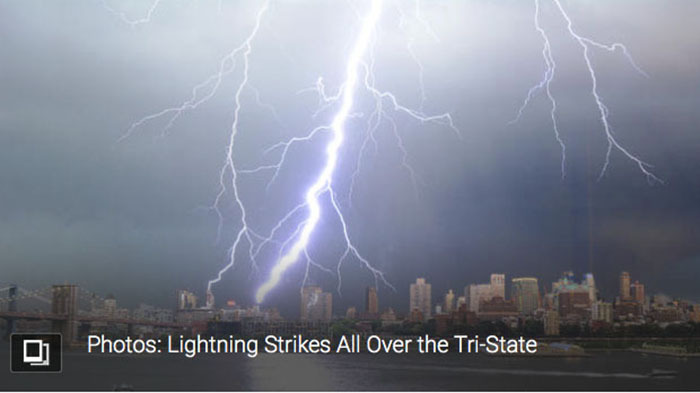 Lightning strikes were responsible for 47 confirmed deaths and 246 confirmed injuries last year, according to the National Oceanic and Atmospheric Administration, and summer is the peak season for lightning-related injuries. The Fourth of July is a particularly deadly time because so many people are outdoors, says Dr. Mary Ann Cooper, professor of emergency medicine and director of the lightning injury research program at the University of Illinois at Chicago. Most people seriously underestimate the risk of being struck by lightning and do not know when or where to take shelter. When a rainbow formed in the sky people stopped and stared at the natural wonder. But then lightning sparked across the evening panorama as two of nature's most spectacular phenomenon created an unusual alliance. The clash of weather was seen above Fort Smith, Arkansas. The intracloud lightning, known as an anvil crawler, is the most common form of lightning, with the electrical charge contained within a single cumulonimbus cloud. Lightning often occurs during heavy storms while rainbows are generally formed after the rain has stopped, making an appearance of both simultaneously relatively rare. The actual electric charge in a flash of lightning comes from particles from the sun sent out in the solar wind which gather in the outer atmospheric layers before creating a strike. Scientists are still divided by what actually causes lightning, with one theory suggesting falling droplets of ice and rain become electrically polarized as they fall through the natural electric field in the Earth's atmosphere. This would explain why lightning often accompanies storms and heavy rain. The same droplets also cause the rainbow, when light from the sun is refracted by the water to cause a spectrum.